Description: Maine Central #706 built by EMD in June of 1946 (bldr #3367) sits waiting at the North Station in Boston. Next to it is Boston & Maine #1564 with BM #1567 in the far distance next to the building. Interesting sidenote - MEC #705-711 had no dynamic brakes or steam generators and MEC #705-708 were a canceled Rock Island order, They were delivered to MEC still in Rock Island paint. 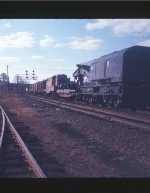 MEC #705-709 were sold to the Kansas City Southern with #706 renumbered to KCS #7 on 10/17/63. Eventually KCS traded #7 to EMD on 9/2/68 and sit was crapped. unknown photographer. Description: The 1567 and 1572 working the hump. 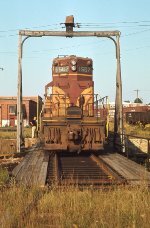 Description: Boston & Maine Railroad GP7 1567 at Mechanicville, New York on July 23, 1976, Kodachrome by J. H. Nixon, Chuck Zeiler collection. There are white dots painted on the trucks for reasons I do not know. Description: A nice & unexpected surprise to see one in old paint! 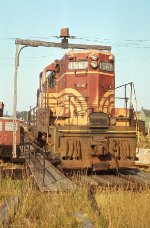 Description: B&M GP7 1567 lays over with SW1 1126 at E Deerfield, MA on Labor Day, 1981. Description: LASE slipping beneath the Central Vermont overhead. Description: EDMA rounding the big curve at Montague. Description: PYRP has crossed Conrail at BD and has turned the corner to come up through the D&H Bevier St yard as it starts up Belden Hill with a monster 138 car train. Thats an NYSW eastbound waiting on a crew at right. it will go later tonight. Description: PYRP has just been given permission out to BD. For all of Guilfords faults, they could put together an eclectic power consist, as we can see on this train. Description: PYRP crossed the high bridge over Wylie Creek, seen from the north side of the bridge on NY 235.